Much of the fun of debating “who would win in a fight” is listening to and giving thoughtful and nuanced arguments about the merits of one’s preferred superhero’s powers buttressed with examples drawn from comic books, t.v. shows, and movies. I suspect that part of the success of recent superhero films is because fight sequences between superheroes are as much desired as the vanquishing of the bad guys. Batman v. Superman (2016) sparked keen anticipation among fans precisely because it promised the spectacle of Batman and Superman fighting. Captain America: Civil War (2016) delivered multiple contests among the Avengers to the delighted fans. Thor: Ragnarok (2017) engaged in fan service when it showed Thor and the Hulk in gladiatorial-style combat. Travis Smith’s Superhero Ethics is fun and polemical. He is trying to pick a fight. If you like superheroes, then you know how fun arguing their merits is. But not on the conventional grounds of superhero abilities. The answer to “who is best?” cannot be decided by powers alone. By best, Smith means who is “most praiseworthy?” (4). It is their “extraordinary characters” not powers of superheroes that make them “super” and “make them heroic and render them worthy of praise” (8). Superheroes recognize that having superior abilities requires decisions on how to use them. Since we can praise superheroes for their moral judgment, then we can blame superheroes for failing short. Smith understands that superheroes encourage us to recognize excellence. Of course, superheroes have abilities and skills that exceed the ordinary measure. Nevertheless, superheroes speak to our human longing to consider what is best and to see the best human qualities represented beyond the ordinary measure. Most importantly, superheroes help us see how we non-supers are in need of excellence and they provide models for our conduct. Just as superheroes have embellished powers, “[s]uperheroes provide exaggerated and extraordinary representations of the qualities that human beings must cultivate in order to confront the quandaries of ordinary life” (8). The super-powers of superheroes are out of reach of us non-supers, but the ethical principles they live by are within our grasp. This is the real crux of Smith’s argument and ultimately his standard for evaluation—which superhero has the virtues that we need most to meet the challenges of ordinary life. The popularity of superheroes implies that many people are searching for models of moral conduct in a confusing world in which character formation is rarely given serious reflection. The number of superhero movies coming soon to a cineplex near you suggests a near insatiable appetite for depictions of moral life. In the introduction, Smith briefly addresses the trend in comic books (and increasingly in t.v. shows and films) of altering the identities of superheroes to be more diverse in terms of race, ethnicity, gender, and orientation. Smith says little about these newer incarnations of diverse superheroes except to caution that for these new characters to become beloved to audiences requires their moral worthiness. Just as superior physical powers do not make a superhero admirable, nor does their identity. What makes superheroes super has always been their superior moral positions. The cleverest aspect of the book is its structure. It is a tournament to see which superhero ethics the world most needs today. Each chapter functions like a bracket in which two superheroes are pitted against each other who are similar. 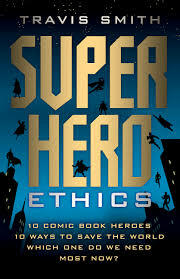 Within the chapters, the superheroes’ ethical positions are outlined, compared, and a winner announced. The winners of each chapter are then sent to the final four round in the conclusion. In the conclusion, Smith notes that the superhero we believe is the most praiseworthy reveals a lot about what we think the biggest problems are in political life today. Each of the four finalist superheroes provides a corrective to different social and political ills. The other division in the book is between the superheroes who offer correctives for the deterioration of personal responsibility in civil society such as Wolverine and Spiderman and the superheroes who present models for political life such as Captain America and Thor. In the first bracket, the beast-like Wolverine and Hulk represent the internal struggle “to preserve our humanity despite the animal the resides within us all” (15). Since they received their powers due to reckless scientific experimentation, they serve as cautionary tales of the dark side of technological thinking that disregards limits. Wolverine easily emerges as victorious. Superheroes who knowingly put their talents to service others are more admirable that superheroes who incidentally serve others. Smith observes that Hulk prefers to be left alone to avoid stimulating his rage. Even as Bruce Banner, he wants to be left alone to his scientific pursuits. It is not from any positive sense of obligation to do good that the Hulk intercedes for others, but he is drawn by sentiment to protect the weak. Wolverine with his gruffness, on the other hand, might be “unsociable—but not antisocial” (22). Wolverine picks fights to protect others, tries live honorably, and finds a home with the X-Men. In the second bracket, the Green Lantern and Iron Man represent two ways of saving the world in which indefatigable confidence in technology and willpower can meet the challenge at hand. Search as he might in their respective myths, Smith does not find any indication that limits are needed. The only limit on the Green Lantern and Iron Man is their imagination. The Green Lantern’s ring literally gives form to the objects of his imagination. Tony Stark as Iron Man has a near limitless capacity to apply science and make the things he imagines. Neither the Green Lantern nor Iron Man makes the grade for Smith. Batman and Spiderman are paired together because both suffered a personal tragedy that led them to adopt their crime-fighting alter ego. This chapter is one of Smith’s best in which he compares their visions of social responsibility. He asks the question “whose version of New York City would you rather live in?” and so connects ethics to the civil societies they produce (65). Spiderman’s New York is preferred to Batman’s dark Gotham. Batman with his gadgets and tactical genius represents the modern project for “mastery over all things” whereas Spiderman exemplifies the need to temper modernity with pre-modern virtues (65). The trouble with Batman is that he does not truly offer a principle of social responsibility that ordinary people can emulate. Only Batman can do what Batman can do. The citizens of Gotham will always need their Dark Knight to assume responsibility for them and save them. Moreover, Batman’s activities do not repair the frayed social fabric in Gotham. My minor complaint about the chapter is that it overlooks The LEGO Batman Movie (2017), which is the finest cinematic presentation of Batman since Christopher Nolan’s trilogy, that addresses on the nose many of Smith’s reservations about Batman as loner. On the other hand, Spiderman’s principle of responsibility holds everyone accountable for how they use the abilities that have been given to them. While Peter Parker’s Jewish heritage was hinted in early comics, it has been more prominent in recent Spiderman comics. Uncle Ben’s proverb “with great power comes great responsibility” is traceable to Jewish and Christian teachings. Smith likens Spiderman’s spider-senses that alert him to Socrates’ daimonion (71). Uncle Ben knew not of Parker’s new powers. He referred to the great power that all individuals as creatures have to share their gifts generously and judiciously with their fellow neighbor. Not only does Parker have guilt for failing to prevent the murder of his uncle, but the last time he saw his uncle, he was insolent. Parker is drawn to the life of a superhero partially to atone and also to live out his uncle’s teaching. Your friendly neighborhood Spiderman points to the need to restore communities and build social capital. Spiderman is a “bowling together hero in a bowling alone world” (145). The comparison of Captain America and Mister Fantastic is a gem. They illustrate the Aristotelian debate between the active life (Captain America) and the contemplative life (Mister Fantastic). More so than in other chapters in which the ethical position of one of the superheroes stood out as more praiseworthy, Smith struggles to choose a winner. Captain America represents what is best in America and advocates “an earnest optimism about the prospect of liberty for all and the alignment of that outcome with justice” (101). Mister Fantastic’s dedication to the transcendent pursuit of truth honors America’s insight inherited from the Puritans (among others) that people are more than citizens. While Reed Richards is not a man of faith, “he embodies an ideal of the good life that exceeds his role as an American citizen yet does not clash with it” (112). The comparison of Captain America and Mister Fantastic’s use of rhetoric is not to be missed (91-92). Smith sides with Captain America because he sees greater need for Captain America’s sense of duty and unflinching resolve to preserve the social conditions that make possible human flourishing. Yet, Smith’s heart seems to be with Mister Fantastic. Smith dings Mister Fantastic for being primarily motivated by “curiosity at the universe’s marvels” (91-92). He cares little for justice or the public’s esteem and fights bad guys mainly because they interfere with his pursuit of knowledge. He has the soul of a scientist whose courage is not, as Smith astutely notes, “thymotic” (92). Nevertheless, Reed Richards as a superhero may be the happiest. Unlike Steve Rogers who is unable to maintain romantic relationships, Reed Richards is married to the Invisible Woman and has children. The Fantastic Four are a close-knit team. The object of Mister Fantastic’s pursuit, truth, as Smith observes, never lets him down. Whereas Captain America serves unfailingly America’s ideals, but is often disappointed by the government’s betrayal of those ideals such as in The Winter Soldier (2014) and Civil War (2016). Although technically Superman and Thor are aliens, they are the most godlike of superheroes. Because they have godlike attributes, it is to be wondered if their ethical principles can be imitated. Smith raises the oft-asked question of Superman—is he too powerful? Smith observes that in some ways Superman’s godlike powers means that his greatest struggle is not against a particular foe, but how to choose who to save given competing pleas for help. Superman cannot be in two places at once. Yet, the true flaw with Superman is that because he is so good, he never struggles morally “as we all must” (126). Just as the ancients recommend that someone of superlative virtue should be expelled from the city, so too does Smith pass on Superman. Thor, however, seems more human. His dad, Odin, continually requires that Thor prove himself worthy of his powerful hammer, Mjolnir, and of ruling. The condition of wielding Mjolnir is being worthy of holding it. Only Thor can pick up his hammer. The power to rule is perfectly aligned with the right to rule. Right to rule here refers to the aristocratic view of best and most praiseworthy not legitimacy. If people are to hold power, then they should be worthy of it. Smith observes that Thor illustrates Tocqueville’s insight that democracies can learn from aristocracies. Thor may be a prince, but in a democratic country, every citizen possesses a measure of power “as a sort of little prince, enjoying rights, liberties, and responsibilities that only elites possesses in more restricted regimes” (136). Among the Norse, Smith observes, Thor was a favored god among the middle-class artisans who felt a kinship to the god who wielded a hammer. Smith notes that “hammers are used to build as well as to destroy” (123). Like Thor, all of us possess powers that either can be used to build or to destroy. It is up to us to use our abilities prudentially. Thor reminds us of our responsibility to strive to be worthy and to use our political power like tiny hammers to build rather than destroy. For these reasons, Smith chooses Thor as the superhero we need most today. Most of all, we need a restoration of the connection between political power and praiseworthiness. Travis Smith’s Superhero Ethics provides a compelling and earnest approach to political thought and the study of superheroes. He persuasively shows that Aristotle, Plato, and Tocqueville (among others) can be in conversation with superheroes—and that they should be. Smith observes that for many people it is through superheroes that they first consider questions like “what kind of life they should lead” (143). Plato used Homeric heroes to explore the virtues and qualities that his fellow Athenians championed. Likewise, we ought to take seriously the virtues (or lack thereof) that our culture promotes through superheroes. A shortcoming of Superhero Ethics is that Smith is overly scrupulous in his effort to avoid wading too deep either in comic book minutiae or philosophic arguments. This is probably desirable if one aims to write a book to appease two dissimilar audiences (comic book fans and philosophy scholars). Nevertheless, some theoretical discussions are too swiftly cut short. When comparing Batman and Spiderman, Travis Smith says that it is a “piety” among comic book fans that Batman “always” wins (86). Nevertheless, Smith judges in favor of Spiderman as the more “praiseworthy” superhero (86). His book Superhero Ethics tramples on perhaps the greatest of superhero pieties that superheroes be evaluated based on their powers. Smith upends this piety. Instead we should evaluate their characters and the goods and political communities they serve. Smith challenges us to remember that the best superheroes show us that the character of a superhero is what makes might right and praiseworthy.